With the rework of all things skeleton done, we’ve moved on to do the last enemy rework announced in our roadmap to the finish line – that of the ghoul. He’s got new looks, new mechanics, a few lore changes and even a new name. Let’s find out more! The what now? 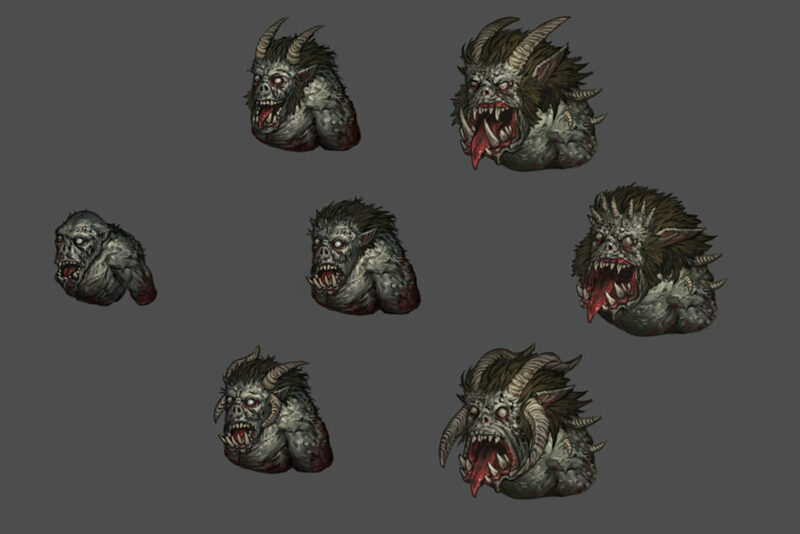 A Nachzehrer is a creature based on German folklore, and it’s going to take the place of the old ghoul in the world of Battle Brothers. The peasantry tells stories of men and women coming back to life after the sin of committing suicide as horribly shaped monstrosities, turned into a Nachzehrer. They’re said to resemble grey-skinned devils that dig up graves with their claws and devour fresh corpses, even devour parts of themselves and their funeral shrouds, and to grow in strength as they do so until they inevitably prey on the living. Others may claim that they are but wild beasts, merely scavengers drawn to fresh graves like seagulls to fishing nets. Whatever their true nature, they bring misery and disease upon any village they bedevil. The old ghoul had a good thing going with its unique mechanic of being able to feast on corpses and thereby growing in size and strength, which in turn had the potential to provide a different experience from fighting other opponents as you defended the fallen from being consumed. We still like it, and we’re keeping it, but we’re doing some changes to put this mechanic more to the center and to give you more incentive to prevent the Nachzehrer from growing. The creature known as Nachzehrer can grow up to two times as it gorges itself on a corpse, and it’s not shy of cannibalizing its own kind. Each time it does so, it increases in size and strength significantly. At its largest, when it’s become a hulking behemoth of grey flesh, it gains the ability to swallow a man whole. Anyone devoured like this isn’t dead, but in the belly of the beast and removed from the map. Slaying the Nachzehrer will free that character again, albeit covered in goo, but retreating while a character is devoured in this way will spell certain death for him. A Nachzehrer has long claws that they use to dig through the earth in search of food, and which can tear grievous wounds in combat. The larger the Nachzehrer, the more dangerous the claws become. On the bright side, a Nachzehrer doesn’t have any armor, which favors swords and cleavers, and it gets easier to hit with ranged weapons, the larger and less nimble it becomes. We want all opponents in Battle Brothers to provide unique challenges and require different tactics to beat reliably. With these changes, each time a Nachzehrer grows should be more impactful, and unless you want to have to fight towering giants that can devour your men whole no matter how fine their armor, actively preventing a flock of Nachzehrers from feasting on corpses has become a much more integral part of fighting them. Additionally, Nachzehrers should now also scale better beyond the initial stages of the game, as later on in your campaign you may meet specimens that have already feasted and grown once or twice. Its just a bunch of ghoules. > a gross enemy appear. What about a (lategame) contract in the fashion of kill-what-terrorizes-the-town where a flock of Nachzehrers came to that town, swallowed several people and vanished again. The goal is to rescue all(/ as many as possible) taken people. After finding the party of big-bellied Nachzehrers one would have to kill the Nachzehrer, free the people and then protect them from being killed. At early game there could only be one person taken and one would face a party with only one big-bellied Nachzehrer, its number would increase later on; so that one then will have to face a party mainly/only consisting of the big-bellied ones, where some of them haven’t swallowed the missing people, but specimen of their own kind (this would be a cool way to additionally emphasize their cannibalistic nature) and the player would have to find all people in a race against time before they are digested, and thus killed. Furthermore one could randomly find a swallowed man when fighting Nachzehrers and after saving him there would be an event with a chance of him wanting to join your group or rewarding you otherwise. If could also be funny to have the Nachzehrers as a contract twist to some of the raze-the-location contracts. You were sent to kill bandits/goblins/orcs, but a swarm of fully-grown Nachzehrer happened to assault that location right before you arrived and swallowed some/most/all of the beings you were ordered to kill, but now you have to deal with them and the Nachzehrers. That’s a good idea for immersion and more quests… I already feel like I’ve done most of them so this would add a nice twist to the game with protecting the swallowed victims and using the upcoming enviroment of a town for example. Any chance a brother could cut himself free, though? It seems they could be a bit OP, swallowing too many people. Will the brothers receive health damage while inside them, too? 1. gibt es vl mal irgendwann ein upgrade wo der spieler selbst ein kleines lager oder ein dorf bauen kann damit ein bisl auch wirtschaftssystem rein kommt ? 2. kommen irgendwann mal auch legendäre waffen? When should we expext ancient skeletons and nachzehrers?